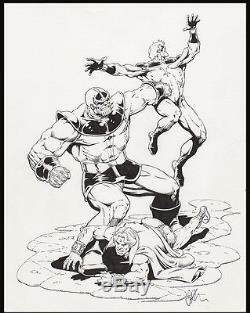 Thanos vs Warlock and Captain Marvel Specialty Art by Jim Starlin. Spectacular specialty artwork piece by Jim Starlin of the titan mutant Thanos battling his archenemies, Warlock and Captain Marvel. This is the finest commission piece we have ever seen by Starlin by far, and features all three of the major characters he is most associated with. Pen and ink on illustration paper in like-new condition with an image area of approx. Signed by Starlin at lower right. Starlin's illustrious career dates back to the 1970's and is best known for his cosmic, space-opera tales. He revamped Captain Marvel and Adam Warlock and created or co-created such major characters as Thanos and Shang-Chi - Master of Kung Fu. His art is highly prized and sought-after among seasoned collectors. The item "Thanos vs Warlock and Captain Marvel Specialty Art by Jim Starlin" is in sale since Sunday, January 08, 2017. This item is in the category "Collectibles\Comics\Original Comic Art\Drawings, Sketches".